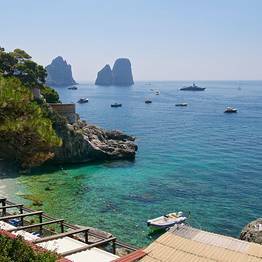 First things first: if you're looking for great stretches of soft golden sand on Italy's island of Capri, you've come to the wrong place! 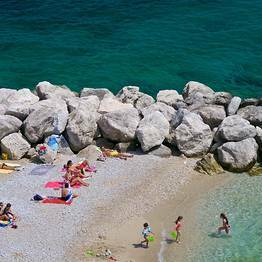 Here the tiny beaches are just a few square meters of pebbles and small platforms positioned between the rocks on the water's edge. 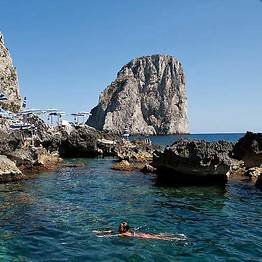 Capri's beaches are miniscule coves tucked between the cliffs with beach clubs offering loungers, umbrellas, and cafès, or public areas with rocks from which swimmers dive directly into the crystalline water. 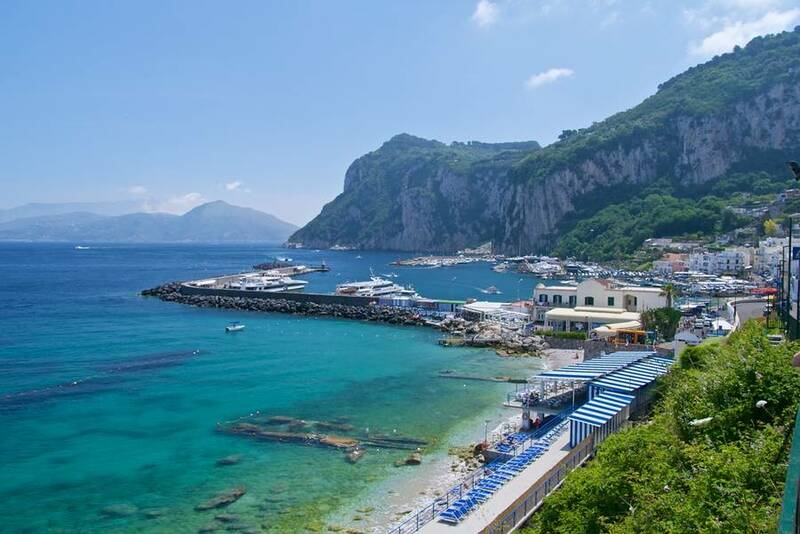 How much does a day on one of Capri's beaches cost? On average, the entrance fee with use of a sun lounger in one of the island's private beach clubs is EUR 20. The cost of hiring a beach umbrella is not included. Marina Grande boasts the biggest beach on the island, right next to the harbor where the ferries dock. Despite the vicinity to the port, the water is always incredibly clean. The sun leaves the beach mid-afternoon. The free beach is located in the vicinity of the ferry ticket offices. Boats taking passengers to the Bagni di Tiberio beach club depart from here regularly. 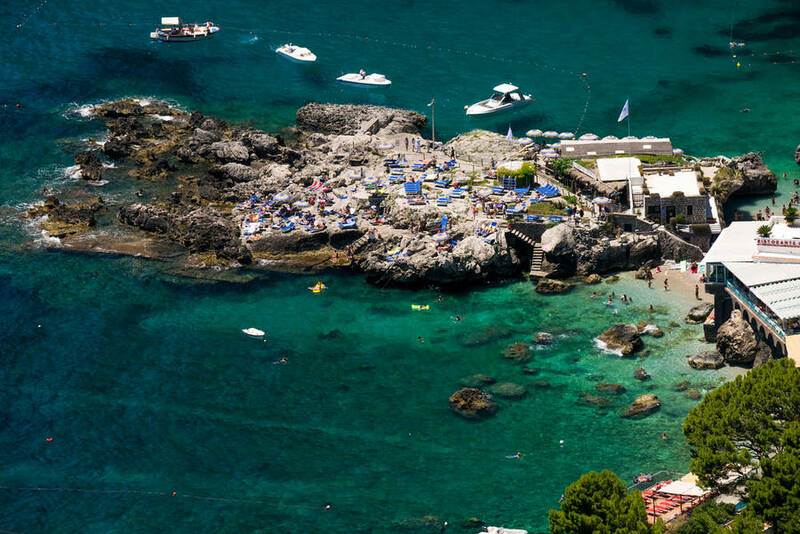 The Palazzo a Mare beach near Marina Grande and accessible only by boat, shuttle, or on foot along the small lanes surrounding the Da Paolino restaurant. 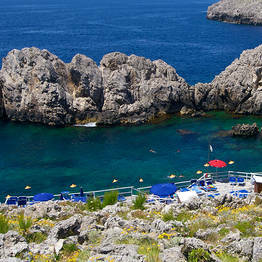 It is a pebble beach with a beach club, restaurant, and small stretch of public beach to one side. 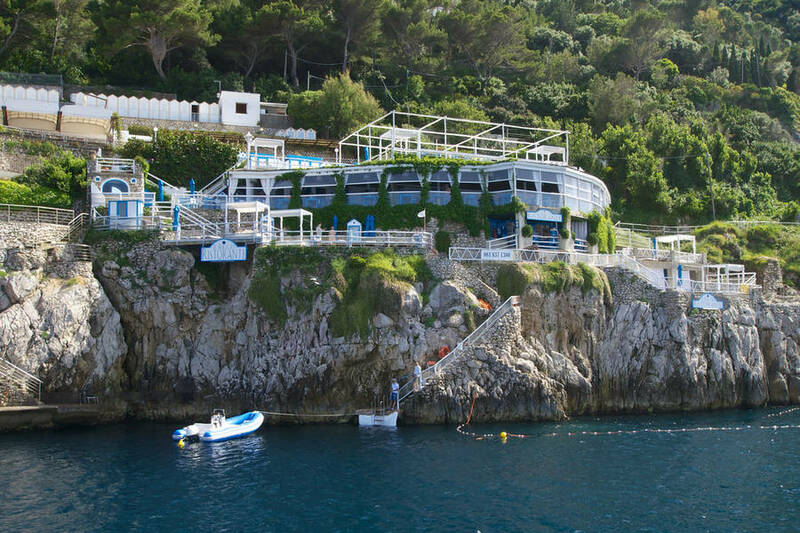 Beach club and restaurant: Bagni di Tiberio. 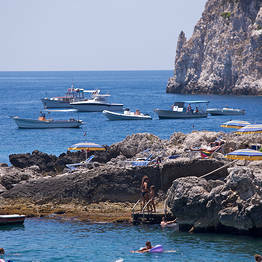 The beaches in Marina Piccola are the most glamorous of all those on the island. You can easily reach the bay on foot by walking down Via Mulo (the road begins at "Due Golfi" at the end of Via Roma). 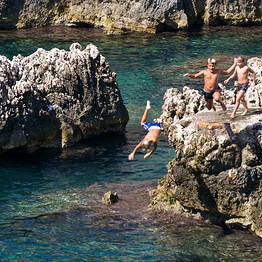 The Faraglioni lie within easy swimming distance. The only downside is that the sun leaves the bay early in the afternoon. There are two public beaches, one on either side of the Siren's rock. From the Punta Tragara viewing point, a narrow trail leads down to the rocks at the foot of the the Faraglioni. Here there are two private beach clubs, each of which has a highly acclaimed restaurant, where you can spend a leisurely day by the sea. 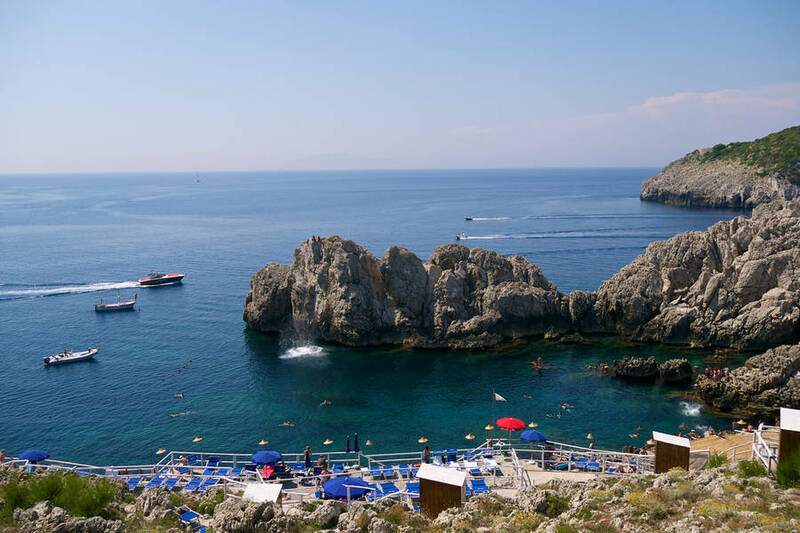 Don't worry about having to make the uphill return journey: both clubs operate a shuttle boat service to Marina Piccola. 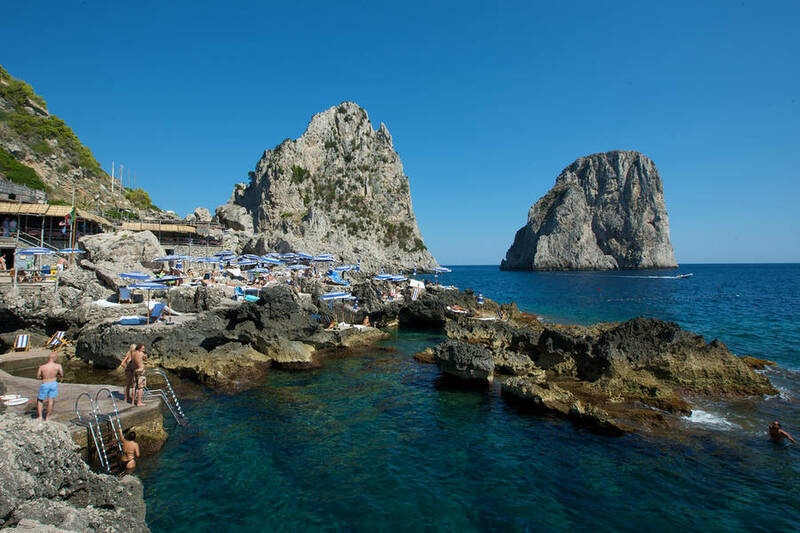 Near the Blue Grotto, there are beach clubs where you can swim and enjoy the sun until late afternoon. There's a free public area too. 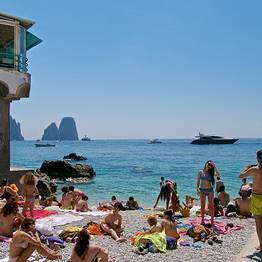 Anacapri's lighthouse is the islanders' favorite beach. This little bay beneath the island's lighthouse is the only place to warmed by the sun from early morning until late in the afternoon, when it sets in a spectacular display of red, yellow, and pink over the water. Private boat tour of the island with a guide. The Piazzetta and Gardens of Augustus.